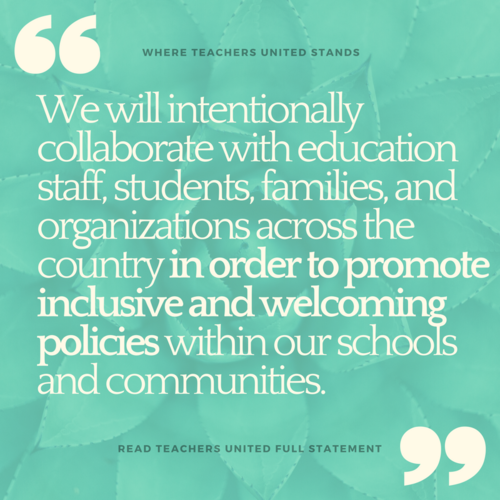 Teachers United is an anti-racist, teacher-led education policy advocacy organization that seeks to insert and elevate the voices of educators in the policy-making process at the district and state levels. From our inception, we’ve believed the single most important in-school factor impacting student achievement is the effectiveness of the teacher in the classroom. However, far too often the voice of effective educators is excluded from the education policy making process. Teachers United, founded in 2011 in Seattle, started as a non-profit organization. When the non-profit shuttered its doors, a key group of TU advocates wanted to continue the work and increase teacher voice in educational advocacy. So, we reorganized in Tacoma in 2015 as a volunteer based group of like-minded advocates. Advocates passionate about using research to inform our voice and work. Then, Teachers United teachers, as part of a policy team, research selected issues in order to craft policy recommendations. Lastly, our members advocate for the implementation of our policy recommendations to education leaders at the state and district level. We believe that teachers know what is best for their students and their classrooms and that there is no one better positioned to advocate for our most vulnerable students than their teachers. Read our latest blog posts published on Teachers United's site or catch up on our members' latest musings around the interwebs. Catch us around the South Sound at one of our events as we talk policy, collaborate in research teams, chat books and unwind with our colleagues. In May 2018, TU discussed our focus areas for the coming school year, which are to expand the work of our first years research and our hybrid roles research. We are always looking for interested parties to be involved in our research, recommendation, and implementation of our policy work. Hybrid Roles: This team began work on September 28, 2017. The team collected research, read and analyzed research and made final recommendations on the future of hybrid roles in education. Now, our work involves making our content consumable and building action at the district and building level. First Years: In 2016-2017 school year, TU focused on First Years in one of our research groups. They published a report on their findings. They’ve worked closely within their buildings to emphasize the work and support that our first years teachers and administrators need. This team will reflect on past work and determine next steps to bringing the findings to district and building level decisions. Writing: We always want to honor teacher voice and provide outlets for our teachers to practice and refine their writing. If you're wanting to get involved in our writing, make sure to connect with Jamie Romberg at one of our TU events.